– The implementation of superior technologies to develop more effective and targeted ADCs. – New and novel payloads, e.g. Antibody Targeted Amanitin Conjugates (ATACs), to improve efficiencies of ADCs. – Using minor-groove binding DNA-interactive molecules as ADC payloads. – The practicalities of the use of Highly Potent Active Pharmaceutical Ingredients within ADC development. – Using fragment drug conjugates to develop a more tailored therapy for solid tumours. – Design principles for maximising the drug delivery efficiency and therapeutic index. Day 1: Compare new generation HER-2 ADCs with Kadcyla™, examine technological advancements on PK-PD, highly potent ingredients, adc payloads and explore drug designs for ADCs; whilst Day 2 takes a look at fragmented drug conjugates and therapeutic windows, warheads and site selectivity, immune-oncological combination therapies, and design principles for maximising drug delivery. 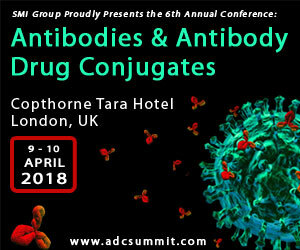 Hear from Spirogen as they discuss one of the main aspects of ADCs; payloads, advanced methods of characterisation will be extremely important as this class of biologics (ADC payloads) is translated to industrial-scale production. Whether or not PBDs make better payloads than others, the clinical progress and current uses of PBDs with case study examples and new PBD payloads in developments; consequences on mode of action, efficacy and tolerability. PBDs are a class of DNA-crosslinking agents, they are significantly more potent than systemic chemotherapeutic drugs. Benefit from Arnaud Tiberghien, Scientist II, Chemistry, Spirogen who will explain the challenges and the significance of PBD payloads. Current antibody-drug conjugates in development have immense promise, but they are limited by the fact that they are structurally heterogeneous populations in which the position and number of conjugated linkers and warheads vary significantly. MedImmune will explore the target, linker, warhead selection: Do’s and Don’ts; five rights of creation of the best optimized fit-for-purpose ADCs; internalisation of ADCs – how to improve internalisation, lysosomal delivery and intracellular target hit and increasing the effectiveness of the ADCs by effective tumour targeting minimising the off-target toxicity of ADCs.